The Criminal Investigation Department demanded to see the first issue of Tsopano before it went to print and though the printers refused on principal, the intrusion scared them off the job. In an attempt to rectify the issue, Mackay demanded that the Ministry of Justice state whether there had been any particular reason for such an intrusion or whether the inspection had been routine. 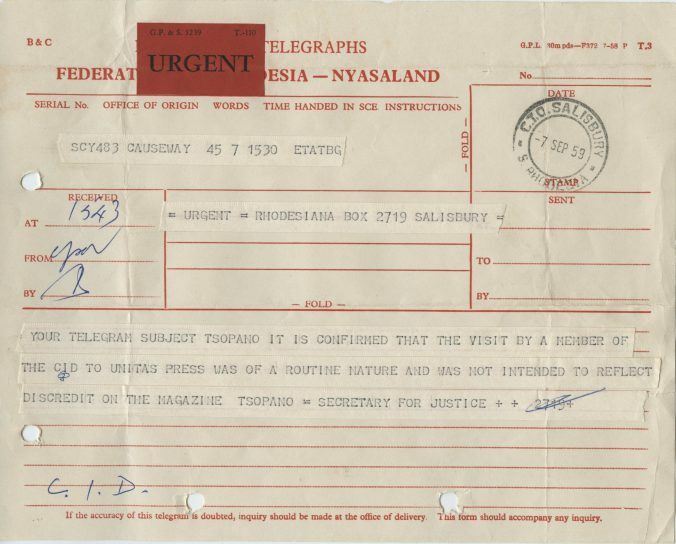 By the time this telegram had been received, the original printers were unable to resume the project, leaving Tsopano to find new printers to work with. These new printers had no scruples about showing Tsopano copy to the police whenever they were asked and Tsopano simply learned to work with it, frustrated by the continued interference but confident that it was doing its best to remain within the bounds of the Emergency Regulations.